Squeezing in a Sunday afternoon ride is one way to hit the relax button before starting up another long week of work. Sometimes the weekends are just not long enough, and they are over in the blink of an eye. Riding the entire weekend, however, now that is what it’s all about my friends. Long winding roads and camping under the stars, that is a trip that does not come fast enough, nor does it easily get forgotten. Riding 2-up with a few necessities can be nothing short of challenging to get all strapped down. Tents, chairs, stoves, coolers, shoes (don’t forget the ladies shoes) and a cooler. And that is just for starters. Let say you want to forgo the camping and stay in a hotel. That works great, but what if you want to bring back some nick-nacks? You could try and ship them through the mail. Or you could just go wherever you want, bring anything that you want, and enjoy wherever you go. Riding is a lot fun, packing is not. How do you bring 3 days and nights worth of gear for 2 people? You could try and tell your partner they can bring whatever will fit in their saddlebag, (and maybe half the trunk). Or you could hook up a trailer and bring whatever you both want. That is what the seasoned riders do. It’s what works. When you decide that a motorcycle trailer is a good solution for you too, you’ll soon discover that you have a few options. 1. Buy one: there are several manufacturers across the US; some boxes with wheels and some painted fiberglass trailers to match your bike. Either way, bring your check book. 2. 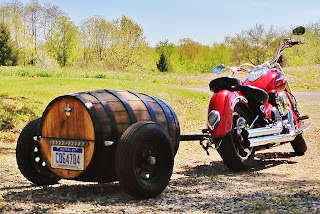 Build one: Buy a cheap Harbor Freight utility trailer and attach minivan storage rack bin, or build a Custom Motorcycle trailer. That’s the option that Karl Steinmeyer over at Get Lost Trailers LLC decided when he wanted a trailer that would stand out. Want to know how he did it from scratch? He’s giving it all up for free.